Photos! The pumpkins were SO COOL! And it was a banner year for growth, holy moly. Check them out! Kissing pumpkins, so Maggie joined in on the love! Medusa! Scary! This was probably a 300 lb pumpkin. This is a painted pumpkin. So big I couldn't even get far enough away! Can you see that tag? It says this pumpkin weighs one thousand, six hundred, and ninety-five pounds. Just, wow. Let that sink in for a minute. One THOUSAND, six HUNDRED, ninety-five. Just a ninety-five pound pumpkin would be ridiculously big, but this!! We didn't catch the regatta, that was on Monday. What's a pumpkin regatta you ask? 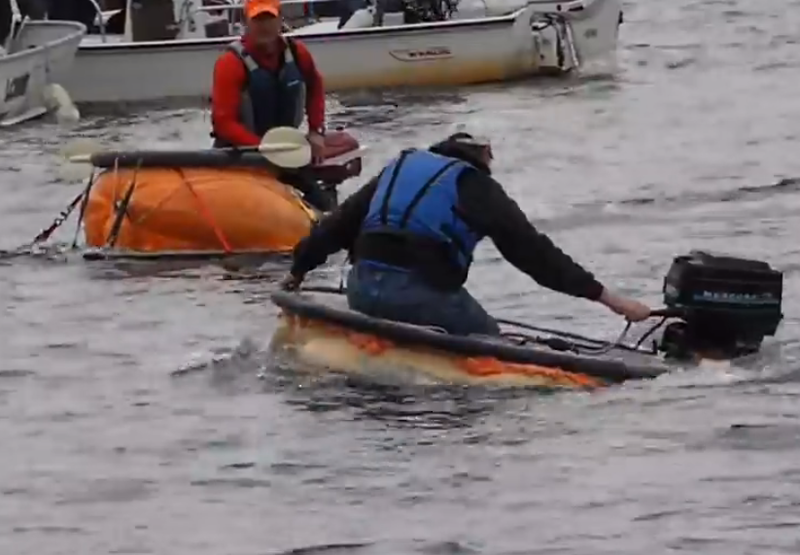 Surely Mainers aren't crazy enough to hollow out a pumpkin, attach an outboard motor, and race them, are they? Super pumpkins, super pictures! I love the one of Maggie kissing that pumpkin!